As a small bunny, my patient and calm demeanor is not typical. Very often bunnies my size tend to be more high-strung and nervous. Life's too short, I just want to enjoy it as much as I can to worry so much! I'm about 4 years old and was surrendered to the Peninsula Humane Society by people who didn't feel like giving me the care I need. I have a minor and very treatable medical condition that requires some basic in-office surgery and periodic monitoring. It's a bit embarrassing to admit, but I have rectal polyps that need to be removed. My vet, Dr.Carolynn Harvey says it's no big deal and should keep anyone from adopting me or effect my health much. It's really cosmetic, because it just doesn't look so perfect "down there". But then again, people don't really need to focus down there all the time. This condition resulted in me being deemed "unadoptable" at the humane society, because they have so many other bunnies and needed the space. 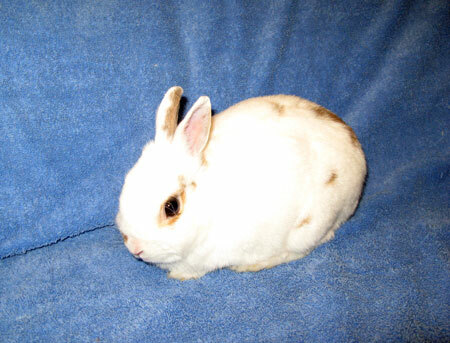 However, I am very adoptable through SaveABunny and am just waiting to be discovered by the right person. My surgery is estimated to cost about $250, and if you would like to donate to help pay for my veterinary expenses, we'd be very grateful.